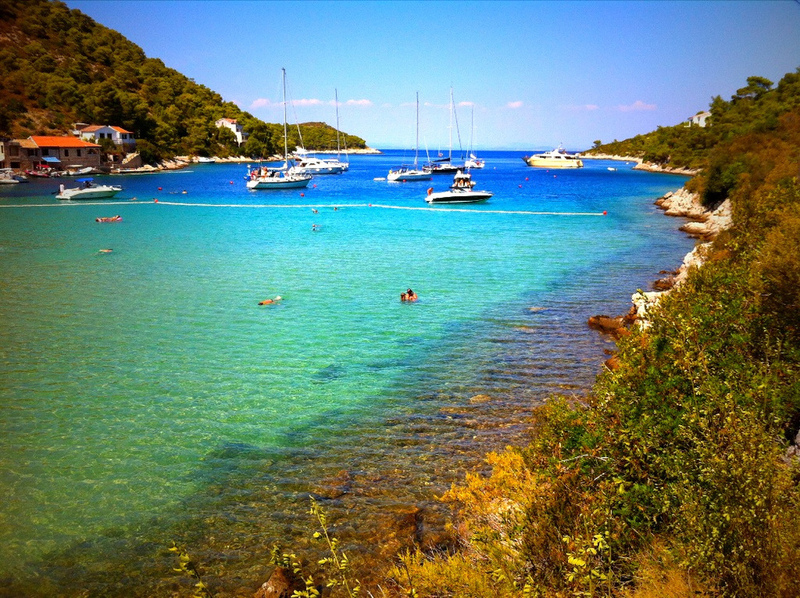 Vis is probably the cleanest part of the Adriatic sea because it is the farthest island from the mainland. Middle Dalmatia islands Solta, Brac and Hvar separates and hide the Vis coasts from the mainland. In 1944 the island was declared a military zone, meaning it would be inaccessible to all foreigners until 1989. Vis isolation has retained the charm and style of life characteristic of the 1950s and which still attracts guests looking for "the Mediterranean as it once was". Stiniva cove, one of the most frequent themes on Croatia's promotional posters. On this side of the island the largest settlements are Milna and Rukavac. However, there are also other things, besides the nature, to do and see. The first settlement on the island was Greek colony Issa, today's urban village Vis, founded in 4th century BC. Later, under Roman rule, on the peninsula Prirovo, were built spa and theater on whose ruins was built a Franciscan monastery in the 15th century. The remains of ancient buildings are visible in the monastery garden and under the sea around the peninsula can be seen the remains of a Roman port. Local gastronomy is rich - in addition to fisheries, another industry that prevails on the island of Vis is wine industry. On the sandy ground three indigenous varieties have been cultivated for centuries: Plavac mali, and Kurteloska Vugava or Bugava. Vugava allegedly comes from the Greek period, and gives Vugava - dry wine, golden color and rich honey flavor. On Vis is baked brandy "lozovaca", which is drunk as a digestive, with the addition of aromatic plants used for medicinal purposes. Vis most famous specialty is a pie prepared from dough with salted anchovies and tomatoes. You can sweeten the pie with cookies that are prepared from simple dough and sugar. Vis offers a unique culinary long meals experience with more sequences (slow food), prepared from only local ingredients on a fully native mode. In addition, the WWF (World Wide Fund for Nature) has named Vis as one of 10 last paradise refuges of the Mediterranean, thanks to its biodiversity.